The World Cup has excluded South African traders... fact or fiction? Editor's notes: In the second of three articles, CNN reports on social initiatives that have played a prominent role, and been at the center of debate, at the 2010 World Cup in South Africa. In part two, we look at whether football's world governing body FIFA has delivered on its promise to involve local traders with the influx of business. Johannesburg, South Africa (CNN) -- Will South Africa, a country that has almost a quarter of its population living in poverty, actually benefit from hosting the 2010 World Cup? Sepp Blatter, the president of world football's governing body FIFA, has stated that a legacy will left there after the first such tournament to be held on the continent. But halfway through the event -- the world's most-watched sporting showpiece -- opinions are divided about whether it is providing the anticipated boost to South Africa's economy. "This [tournament] has to be about ... legacy. Bringing boys and girls together, organizing schooling and health education, providing the tools and the incentive to fight against poverty and disease -- that is the legacy we want to leave," Blatter said before the June 11 kickoff. Accounting firm Grant Thornton predicted that tournament tourists would inject $1.7 billion into South Africa's economy over the month-long festival of soccer, helping to boost economic growth of the "Rainbow Nation" by 0.5 percentage points. Indirect spending and infrastructure investment over the four years preceding kickoff was worth $12.2 billion, according to the study. Such benefits would be a great boost to a nation that the CIA World Factbook states had 24 percent of its population living below the international poverty line -- spending less than $1.25 a day -- in 2009. According to Statistics South Africa, 25 percent of people were unemployed in the first quarter of 2010, compared to the United States' unemployment rate of 9.3 percent (2009) and 12 percent of the population living under the international poverty line (2004). The World Cup's fight against AIDS: Fact or fiction? America and much of the European Union economies have weathered recession recently, but the figures of 2006 World Cup host Germany -- which had 8.2 percent unemployment in 2009 and 11 percent of the population living under the poverty line -- still compare favorably with those of South Africa. A study carried out by the Johannes Gutenberg University in Mainz found that 1.3 million visitors visited Germany for the 2006 edition of tournament, spending €2.5 billion ($3 billion). Importantly, South Africa's economy is structured differently. The Human Science Research Council (HSRC) estimates that 27 percent of its domestic labor force is employed in the "informal" economy -- a sector that is comprised primarily of street traders, hawkers and market vendors. So, have local traders missed out on the World Cup boom? Cheche Selepe -- a spokesperson for the World Class Cities for All Campaign (WCCA), a movement also associated with Streetnet International -- told CNN that the World Cup had so far been a missed opportunity for those employed in this area. 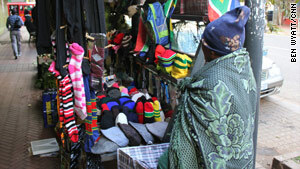 Vendors at a street pitch in Soweto. "It has delivered poverty, eviction and children who find their parents now income-less. Many of the hawkers and traders have been moved [from the stadium areas] without any alternative," said Selepe, whose group represents 10,000 street traders in Johannesburg. "The traders at Soccer City were there before the World Cup was announced, were there as the stadium was built, and were then moved on when the tournament started. You cannot move people without giving them proper alternatives to make a living. "The only hawkers they allow in the stadium are employed by big companies to sell Coca-Cola or ice creams and so on. They're all expensive goods, and they are employing immigrants and paying them next to nothing, people in desperate situations." Streetnet International estimated that more than 100,000 South African street and informal traders could have lost their income streams during the World Cup after organizers forcibly removed vendors from exclusion zones set up around stadia and Fan Fests. "At the very least, 0.7 percent of the profits from the World Cup should be channeled into development programs for the street vendors in the host cities," Streetnet's international coordinator Pat Horn stated on the organization's official website. FIFA told CNN it had been working with the South African government to integrate the informal sector into all "operational areas" of the World Cup. 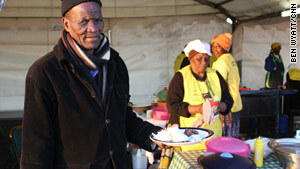 Lazarus Tlhahlane sells meals to volunteer workers. "Informal market areas have been established at the main access routes before the exclusion zone to the stadiums. Traders can sell [goods] that would be competitors to the official sponsors," FIFA said in a statement. "FIFA has trained 5,500 community staff for the World Cup and trained 6,000 unskilled workers as service staff who all will receive a certificate to help them to find qualified jobs beyond the [tournament]. "With the intent of uplifting and empowering local communities, and as per the recently-published financial report of the Local Organizing Committee, 85 percent of its total expenditure to date had been procured from suppliers classified within the [informal economy]." Local food trader Lazarus Tlhahlane, 72, who is a member of the WCCA organization, sold his menu of local maize-based dishes at the Soccer City site when the arena was being constructed, but was then moved from the location. Tlhahlane told CNN that after registering with FIFA, he and his company of eight people had traded at Johannesburg's Soccer City and Ellis Park stadiums as well as the Soweto Fan Fest throughout the World Cup. "We are selling more. We're now catering for the volunteers and those who are [working here], the vendors who are selling. They've divided us [traders] into two. These vendors who are selling for cash and then we are caterers just for the volunteers." Can soccer heal a scarred society? Tlhahlane collects a voucher worth $8 for each meal he sells -- which, on average, number 30 a day. "It's very wonderful work with the volunteers, though we are only going to get our money after the World Cup," he said. "Every night they phone us telling us where to go. Maybe they can tell me to go somewhere on the fan park or another location. I'm happy with that because the business they're giving us is equal. Nobody's selling more than the other, we are trusted. "Cynthia" is one of the traders who did not register with FIFA. "The World Cup experience has been up to my expectations. Everyone has a signed contract. We're encountering problems because we have no money until the end of the World Cup, so we are still negotiating to be able to sell in cash." 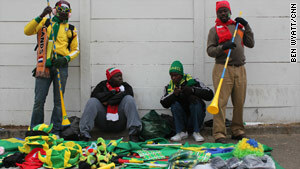 Soweto resident Dingaan Moyo, 38, has traded his football merchandise -- including scarves, vuvuzela horns and flags -- from street pitches for 20 years. From a sales location in Doorfontein close to Ellis Park, he told CNN he felt satisfied with the benefits of the tournament despite business not being exceptional. "Sales have gone up, but not by much. I used to trade around the stadiums before the World Cup and I normally trade inside the stadiums at the domestic Premier League games," he said. "[Before the World Cup] I registered with FIFA. I just filled out a form with my identity documents and they gave me the official card. I'm 100 percent happy and I don't really know of problems with other traders." However, not all traders felt they had been included in the plans of the tournament's organizers, who have sought to prevent unofficial traders from gaining access to prominent areas. "Cynthia" -- a 50-year-old trading soccer scarves and knitwear on a roadside in Hillbrow -- did not want to use her real name. But she told CNN: "I haven't made any profit from the World Cup, the products like the vuvuzelas are too expensive to stock for me to make money." She did not try to register with FIFA because of reports she read in local newspapers that traders would be made to stay away from the stadiums. "There is nothing we are gaining. I can't say I'm happy as all the time it is the big companies gaining." Bianca Bothma also contributed to this report.